Some are brand-new, most are used; age and condition vary from near-mint recent publications to not-so-hot well-used editions. I'll try to note obvious defects, but may miss something. First come, first served, and all patterns sold "as is." Unless otherwise stated, these publications do NOT contain my own designs. Please Email me with any questions before ordering. I'll be adding to the list periodically, so if you're looking for something special, keep checking back! 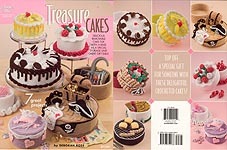 Crochet Treasure Cakes, designed by Deborah Ross, Annie's Attic, Inc., 2010. 7 great flavors of "eye- candy" cakes. 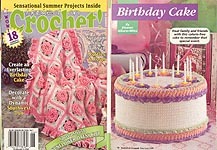 Removable crocheted cake top covers a crochet-covered plastic- canvas storage box. Brand new 2010 release! Crochet It's Play Time!, designed by Sally Byrne, Annie's Attic, Inc., 2010.Fun crocheted toy sets include: Gone Shopping (Purse, Key Chain, Wallet, Coins, Hairbrush, & Lipstick), Tool Set (Hammer, Wrench, Plisers, Screwdriver & Toolbelt), Fried Eggs (Frying Pan, Spatula, Whole Egg, Fried Egg), Breakfast Time (Milk Bottle, Cereal Bowl, Spoon, and Banana), and Baking Utensils (Bowl, Utensils, Egg Carton, Eggs, Gingerbread Man). Brand new 2010 release! 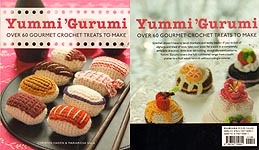 Yummi 'Gurumi, designed by Christen Haden & Mariarosa Sala, Ivy Press, 2010. Over 60 gourmet crochet treats, including: FRUIT SALAD -- Apple, Apple Slice, Strawberry, Strawberry Slice, Watermelon Slice, Persimmon Slice, Kiwi Slice, Peach Slice, Star Fruit Slice Orange Segment, Orange Slice, Pineapple Slice; VEGETABLE DIP -- Broccoli Floret, Cauliflower Floret, Carrot, Pickle, Cucumber Slice, Stuffed Olive, Cherr Tomato, Celery Stick, Whole Pea Pod, Bowl of Dip; SUSHI PLATTER -- Nigiri Rice Base, Tuna Nigiri, Salmon Nigiri, Egg Nigiri, Octopus Nigiri, Clam Nigiri, Crabstick Nigiri, Eel Nigiri, Shrimp Nigiri, Inside Out Roll, Cucumber Roll, Futomaki, Battleship Roll, Pickled GInger, Wasabi; DIM SUM BASKET -- Peach Bun, Pork Bun, Steamed Bun, Siu Mai, Sticky Rice Parcel, Scallion Pancake; STIR FRY SELECTION -- Sauce Bottle, Shaker, Zucchini Piece, Onion Rings, Egg Shrimp, Beef and Chicken Strips, Scallop, Bean Sprout; SANDWICH BAR -- Bread Slice, Tomato Slice, Lettuce Leaf, Bacon Slice, Cheese Slice (2); CHEESE BOARD -- Wine Bottle, Cheese Wedge, Gouda, Cammenbert, Small Individual Pieces of Cheese, Round Cracker, Square Cracker; SWEET TREATS -- Cherry Cake, Orange Cake, Strawberry Cake, Wedding Cake, Birthday Cake. Like new, but may smell slightly of cigarette smoke. Crochet Toy Food, Annie's Attic, Inc., 1988. Contains instructions for Loaf of Bread, Ice Cream Cone, French Fries, Ice Cream Sandwich, Ketchup & Mustard, Strawberry Shake, Sandwich Cookie, Hamburger (with the works), Bologna Sandwich, Package of Bacon, Hot Dog & Bun, Box of Popcorn, Pretzel, Pancakes & Sausage, Cinnamon Roll, Fried Egg and Bacon, Egg Cargon, Bag of Peanuts, and Eggs. Like new. 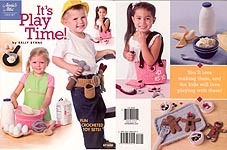 Plastic Canvas Playtime Food, designed by Mary Layfield, Annie's Attic, Inc., 2000. 32 designs on 7- mesh plastic canvas include: Fried Egg and Bacon, Toast, Waffle, Orange Juice Carton, Syrup Bottle, Ketchup & Mustard, Pizza, French Fries, Bologna Sandwich with Swiss Cheese, Hot Dog & Bun, Salt & Pepper Shakers, Butter & Dish, Milk Carton, Steak, Ice Cream Bar, Lattice Pie, Cake Server, Bundt Cake, Cookie Plate & Cookies (Chocolate Chip, Chocolate Cream, Candy Cane, Swirl, Butter Cookie, and Brownie), and a marvelous Special Occasions Cake in three layers with accessories for Wedding Cake, Birthday Cake, etc. The bottom layer serves as storage for other pieces! Very good condition. 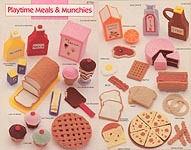 Playtime Meals & Munchies in Plastic Canvas, designed by Mary Layfield, Annie's Attic, Inc., 1988. Contains instructions for Loaf of Bread, Ice Cream Cone, French Fries, Onion Rings, Ice Cream Bar, Ketchup & Mustard, Salt & Pepper Shakers, Butter & Dish, Ice Cream Carton, Cupcakes, Lattice Pie, Orange Slice & Juice Carton, Milk Carton, Bologna Sandwich with Swiss Cheese, Hot Dog & Bun, Fried Egg and Bacon, Toast, Steak, Waffle, Syrup Bottle, Cakewith Slices, and Pizza. Covers wrinkled as if something wet had been set on booklet; some corresponding wrinkling on inside pages -- but otherwise very good condition. 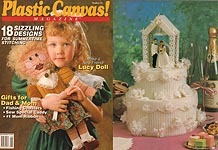 Plastic Canvas Playtime Bakery, designed by Mary Layfield, Annie's Attic, Inc., 1989. 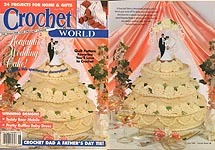 Contains instructions for Cake Saver, Cookie Jar & Cookies, Bundt Cake, Cookie Sheet & Cutters, Gingerbread Man & Woman, Cake Plates, Brownies & Pan, and a marvelous Special Occasions Cake in three layers with accessories for Wedding Cake, Birthday Cake, etc. The bottom layer serves as storage for other pieces! Like new, but may have faint smell of fabric softener sheet. 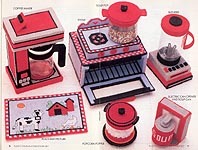 Plastic Canvas Playtime Kitchen Set, designed by Mary Layfield, Annie's Attic, Inc., 1989. Contains instructions for Coffee Maker & Pot, Place Mat/ Picture, Popcorn Popper, Electric Can Opener & Soup Can, Blender, Stove, and Soup Pot. Like new. 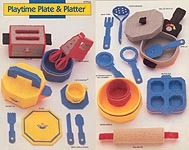 Plastic Canvas Playtime Plate & Platter, designed by Mary Layfield, Annie's Attic, Inc., 1989. Contains instructions for Toaster, Hand Mixer, Tea Kettle, Plate, Cup & Saucer, Knife, Fork, Spoon, Meat Fork, Potato Masher, Skillet & Lid, Spatula, Ice Cream Scoop, Tea Strainer, Mixing Bowls, Muffin Tim, and Rolling Pin. Definitely used -- According to note written on pattern, former owner made at least two sets of these! Numbers by graphs to keep track of holes, some underlining in instructions.. Plastic Canvas Playtime Picnic, Annie's Attic, Inc., 1989. Contains instructions for Picnic Basket, Thermal Jug, Potato Chips & Bag, Pickles & Jar, Watermelon Slice, Hamburger with Cheese, Paper Plate, Funglasses, Bandage Box, Charcoal Briquettes, Soda Pop Can & Holder, Corn on the Cob, Hibachi, Lemonade, Ice Cream Freezer, and Cooler. Like new. 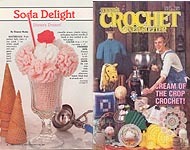 SODA DELIGHT, Annie's Crochet Newsletter #15, May-June 1985: Other patterns in this issue include: Lady's Bundle Knot Sweater, Racket Cover, Palomino Pony, Ring Bearer's Pillow, Daisy Pillow Trim, Round Daisy Doily, Geometric Pillow, Oval Cross-Stitch Rug, Daisy Baby Afghan, Little Red, Sunburst Kitchen Set, Child's Vest, Hat Wall Hanging. Excellent condition. Annie's Attic Crochet Sweet Dreams, designed by Annie Potter, Annie's Attic, Inc., 1980, 1984, 1994. 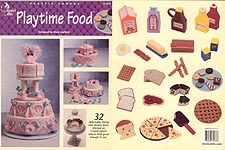 Very popular but hard to find book containing instructions for mouth- watering, real- looking desserts such as: beautifully decorated chocolate cake, heart-shaped box of chocolates, Banana Split, Blackberry Pie, Plate of Cupcakes, and Triple-Dip Ice Cream Cone. Excellent condition. 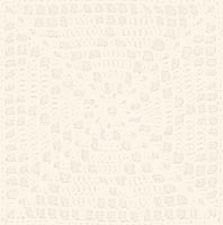 A note on the black and white versions of Annie's Attic patterns (featured below): these are the ORIGINAL "first-edition" versions of the patterns, not copies! 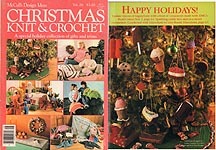 When Annie's Attic first started, patterns were written by Annie, the small staff, and members of Annie's Pattern Club. They were printed in black and white, folded in thirds, and mailed in small brown paper bags! Later, as the company grew, many of these patterns were reprinted as digest-size color leaflets. The originals can be somewhat fragile, as they were printed before the high-quality acid-free papers of today. Annie's Attic Sweet Dreams: CHOCOLATE CAKE, designed by Annie Potter, Annie's Pattern Club; 1980, 1984. Color reprint of original b/w leaflet. Very good condition. Annie's Attic Sweet Dreams: CHOCOLATE CAKE, designed by Annie Potter, Annie's Pattern Club; 1980. Hard-to-find, ORIGINAL black and white version. Page creased from mailing and slightly yellowed. Otherwise, very good condition. 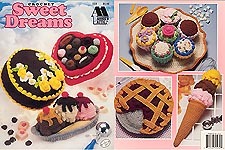 Annie's Attic Sweet Dreams: BLACKBERRY PIE, designed by Annie Potter, Annie's Pattern Club; 1980, 1984. Color reprint of original b/w leaflet. Very good condition. Annie's Attic Sweet Dreams: BLACKBERRY PIE, designed by Annie Potter, Annie's Pattern Club; 1980. Hard-to-find, ORIGINAL black and white version. Page creased from mailing and slightly yellowed but in good condition. Annie's Attic Sweet Dreams: BANANA SPLIT, designed by Annie Potter, Annie's Pattern Club; 1980, 1984. Color reprint of original b/w leaflet. Very good condition. Annie's Attic Sweet Dreams: BANANA SPLIT, designed by Annie Potter, Annie's Pattern Club; 1980. Hard-to-find, ORIGINAL black and white version. Page creased from mailing and slightly yellowed but otherwise very good condition. Annie's Attic Sweet Dreams: TRIPLE DIP ICE CREAM CONE, designed by Annie Potter, Annie's Pattern Club; 1980, 1984. Color reprint of original b/w leaflet. Very good condition. Annie's Attic Sweet Dreams: TRIPLE DIP ICE CREAM CONE, designed by Annie Potter, Annie's Pattern Club; 1980. Hard-to-find, ORIGINAL black and white version. Page creased from mailing and slightly yellowed but otherwise very good condition. Annie's Attic Sweet Dreams: PLATE OF CUPCAKES, designed by Annie Potter, Annie's Pattern Club; 1980, 1984. Color reprint of original b/w leaflet. Very good condition. Annie's Attic Sweet Dreams: PLATE OF CUPCAKES, designed by Annie Potter, Annie's Pattern Club; 1980. Hard-to-find, ORIGINAL black and white version. Page creased from mailing and slightly yellowed but otherwise very good condition. Annie's Attic Sweet Dreams: BOX OF CANDY, designed by Annie Potter, Annie's Pattern Club; 1980, 1984. Color reprint of original b/w leaflet. Very good condition. Annie's Attic Sweet Dreams: BOX OF CANDY, designed by Annie Potter, Annie's Pattern Club; 1980. Hard-to-find, ORIGINAL black and white version. Page creased from mailing and slightly yellowed but otherwise very good condition. Plastic Canvas No- Calorie Candies, designed by Kathryn Bath Schaller, The Needlecraft Shop, 1991. Designs stitched on 7- mesh with raffia straw include: Assorted Chocolates (Tray, Chocolate Mints, Fudge Squares), Cherry Bon Bons, Lemon Drops, Taffy Basket, Petits Fours with Dish. Excellent condition. 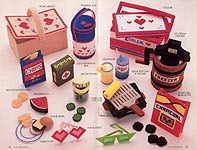 Plastic Canvas Little Chef, designed by Diane T. Ray & Sandra Miller Maxfield, The Needlecraft Shop, 1998. Designs on 7- mesh include: Wake Up Call (Toast, Ham Piece, Egg, Butter Pat, Bacon Strip, Juice Carton); Let's Do Lunch (Chip Bag, Soda Can, Hamburger, Onion Piece, Pickle Piece, Tomato Piece); Condiments (Ketchup Bottle, Mustard Bottle, Mayo Jar, Pickle Jar); It's Cleanup Time (Wrap Box, Laundry Soap Box); Sweet Treats -- Popsicles. Excellent condition. Gourmet Crochet Chocolate Sweets and Treats, designed by Carolyn Christmas, Carolyn Christmas Designs, 2007. Digest-size book. Delightful treats to crochet include: Chocolate- Dipped Strawberries, Chocolate Decadence Cake, Chocolate Mocha Raspberry Dessert, Individual Three- Tiered Cakes, Chocolate Cupcake, Chocolate Sandwich Cookie, Chocolate Chip Cookie, Candy Cookie Ice Cream Sandwich. CONDITION PROBLEMS: My first reaction was, the cover of this looks like it's been run over by a pickup truck! Front and back covers wrinkled and dirty. Pages warped as if they have been wet and center staples rusted. Pages in surprisingly clean and good condition, though, barring the warping. 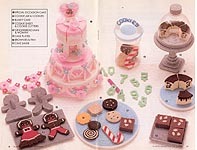 The Needlecraft Shop Crochet Collector's Series: Cupcakes & Petit Fours, designed by Eleanor Albano- Miles, The Needlecraft Shop, 1998. One- page pattern sheet from subscription series. These dainty delights are crocheted using LusterSheen or sport yarn, size 3 crochet cotton, and size 10 crochet cotton. Excellent condition. 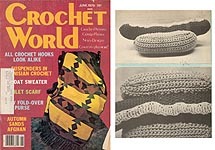 Annie's Attic Crochet Deli: Big McPotholder, designed by Magdala T. Ray, Annie's Pattern Club; 1981. 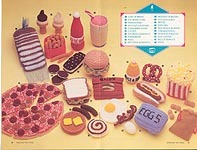 Hard-to-find, ORIGINAL black and white version features Bun, Hamburger, Tomato Slice, Lettuce, and Cheese potholders. Excellent condition. Annie's Attic Crochet Deli: Li'l Burger Hot Pads, designed by Sandra Maxfield, Annie's Pattern Club; 1981. 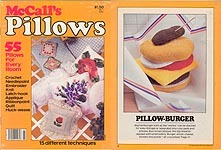 Hard-to-find, ORIGINAL black and white version features Bun, Hamburger, Tomato Slice, Lettuce, and Cheese potholders. Excellent condition. Annie's Attic Crochet Deli: Strawberry Shake, designed by Lucille Smego, Annie's Pattern Club; 1982. Hard-to-find, ORIGINAL black and white version. Excellent condition. Annie's Attic Crochet Deli: Golden Fries & Ketchup Potholder, designed by Lucille Smego & Inna Milton, Annie's Pattern Club; 1982. Hard-to-find, ORIGINAL black and white version. Excellent condition. Annie's Attic Crochet Deli: Hot Pot Dog, designed by Sandee Stuhmer, Annie's Pattern Club; 1982. Hard-to-find, ORIGINAL black and white version. Excellent condition. 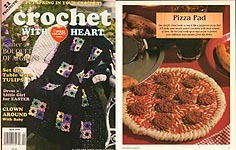 Annie's Attic Crochet Deli: Pizza Supreme Potholder, designed by Lucille Smego, Annie's Pattern Club; 1982. Hard-to-find, ORIGINAL black and white version. Excellent condition. 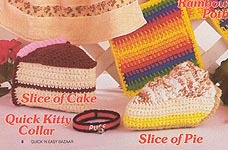 Annie's Attic Crochet Deli: Peppy Pizza Slice, designed by Barbara Anderson, Annie's Pattern Club; 1982. Hard-to-find, ORIGINAL black and white version. Excellent condition. Annie's Attic Crochet Deli: Ice Cream Sandwich & Cinnamon Roll Pot Holder, designed by Janice Riley & Freda Norman, Annie's Pattern Club; 1982. Hard-to-find, ORIGINAL black and white version. Excellent condition. Annie's Attic Crochet Deli: Lettuce & Tomato Sandwich, designed by Lillian Jones, Annie's Pattern Club; 1982. Hard-to-find, ORIGINAL black and white version. Excellent condition. Annie's Attic Crochet Deli: Perk- Em- Up Pancakes, designed by Cheryl Edings, Annie's Pattern Club; 1982. Hard-to-find, ORIGINAL black and white version. Excellent condition. Annie's Attic Crochet Deli: Luigi Le Chef Doll, designed by Kathryn Morse, Annie's Pattern Club; 1982. Hard-to-find, ORIGINAL black and white version. Excellent condition. Annie's Attic Crochet Deli: Luigi Le Chef Doll, designed by Kathryn Morse, Annie's Pattern Club; 1982. Hard-to-find, ORIGINAL black and white version. Page 3-hole punched, creased from original mailing and slightly yellowed but in good condition.